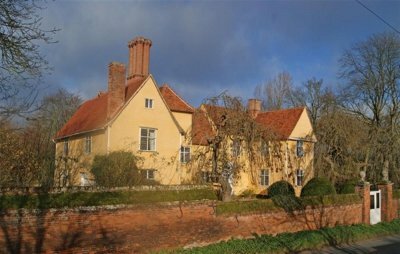 The cottage we have for you this month is "The Grand Farmhouse" near Dedham, in Suffolk. The reason we've singled this particular cottage out is because it is a lovely old building to spend a few days; and The Grand Farmhouse sleeps 22 people - which means there aren't too many holiday cottages like The Grand Farmhouse around. The Grand Farmhouse is a 17th century farm house, which has been lovingly restored to provide this exceptional holiday accommodation. Set in 3 acres of grounds (including two paddocks), The Grand Farmhouse has enclosed gardens for you to enjoy, and for any children you may have in tow to run around in. As this farmhouse sleeps 22 people, The Grand Farmhouse is a great place to spend some time with friends and family. There are 7 bedrooms here: 6 double bedrooms and 1 children's bedroom with 4 single beds. Some of the double bedrooms also have single beds in them. The sitting room has a TV and DVD, and a wood burning stove - having a wood burning stove can really make a winter short break something special; you can all sit around the fire and enjoy a glass of your favourite tipple. There's a TV room too - so the children can entertain themselves while you enjoy that glass of something relaxing. Not quite so exciting, but very handy, is the utility room with a washing machine and tumble dryer. The Grand Farmhouse has Wi-Fi too, so you can happily keep up-to-date with Facebook. For those with a dog as part of the family, you'll be pleased to hear that The Grand Farmhouse is "pet friendly", so your dog can holiday with you. Around the area you've got the small town of Dedham just down the road, the large town of Colchester is a short drive away too. You can also head to the coast and experience those traditional seaside towns of Frinton-On-Sea and Walton-On-Naze. Or, closer to the cottage, enjoy walks and cycle rides in the Suffolk countryside. The nearest pub and shop is around 2 miles away from The Grand Farmhouse. Holidays start on a Friday at The Grand Farmhouse - short breaks are also available, so you can always try a long weekend.